Including olive oil in your diet has many health benefits and extra virgin olive oil is the best. But the olive oil industry is corrupt and the EVOO you buy may be fraudulently labeled. 1. Extra virgin olive oil is high in antioxidants such as oleocanthal, which has an anti-inflammatory effect similar to ibuprofen; and antioxidant oleuropein–a substance that protects LDL cholesterol from oxidization. What are the different kinds of olive oil? Extra virgin olive oil: must be produced by mechanical extraction methods (no chemicals or hot water applied); come only from first cold-pressing; have an oleic acidity level of less than 1%; and must have a perfect taste. Virgin olive oils are the only grade of olive oil that contain all the nutrients and vitamins available from olive oil and extra virgin olive oils have the best flavor. Virgin olive oil: like extra virgin olive oil is produced without refining, but may have an acidity level up to 2%. Its taste is less mild than extra virgin olive oil. Pure olive oil: is a blend of virgin olive oil and refined olive oil. It’s less expensive, but has little nutritional value and isn’t good in dressings. It’s used mainly for cooking. Light olive oil: has the same fat content as extra virgin olive oil, but is called light because it’s highly filtered or refined, thus having less flavor and color. A small amount of higher grade olive oil or even vegetable oils may be added back in to add some flavor. 1. Buy fresh olive oil that has a harvest date on the bottle. Look for the most recent harvest, which is usually November-December in the Northern Hemisphere and May-June in the Southern Hemisphere. Don’t rely on the “best buy” date, which is usually two years from when the bottle was filled, not when the olives were processed, and won’t ensure fresh olive oil. 2. Look for dark glass bottles. Olive oil goes rancid more quickly if stored in a clear or plastic bottle. 4. Store in a cool and dark location because heat and light will decrease the shelf life of your oil. 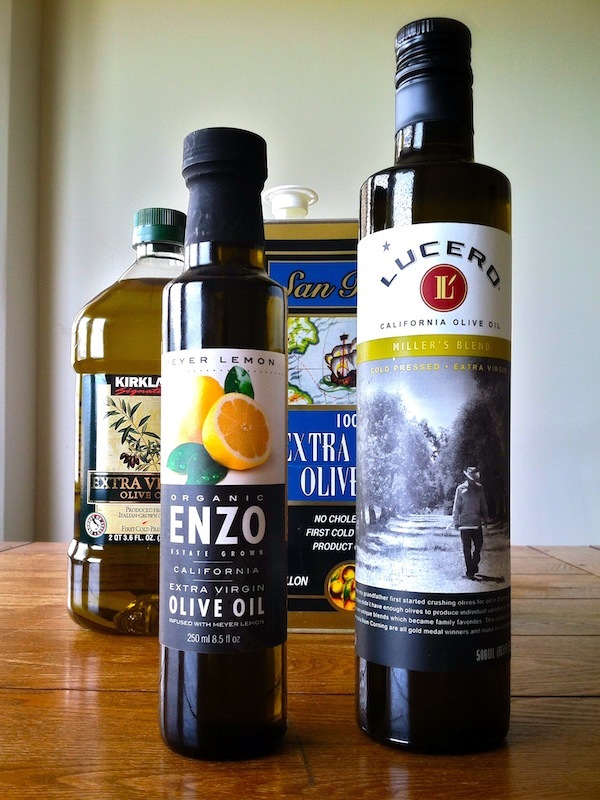 What are the best brands of extra virgin olive oil? While there are many excellent imported and extra virgin olive oils available in California, our findings indicate that the quality level of the largest imported brand names is inconsistent at best, and that most of the top-selling olive oil brands we examined regularly failed to meet international standards for extra virgin olive oil. Our testing indicated that the samples failed extra virgin olive oil standards according to one or more of the following: (a) oxidation by exposure to elevated temperatures, light, and/or aging; (b) adulteration with cheaper reﬁned olive oil; and (c) poor quality oil made from damaged and overripe olives, processing ﬂaws, and/or improper oil storage. Tom Mueller wrote a book entitled Extra Virginity: The Sublime and Scandalous World of Olive Oil. He also has a website Truth in Olive Oil that has a lot of good information about olive oil. NPR interviewed him and I found the information very interesting. Losing ‘Virginity’: Olive Oil’s ‘Scandalous’ Fraud. Tip: Purchase smaller amounts of high-quality EVOO more frequently and store it in a cool, dark place to ensure the healthiest and best tasting product. If you want a milder taste, rather than buying “light” olive oil, which is refined, purchase EVOO that has a “delicate” or “mild” flavor. « Is butter good for you?